Maybe it's a sign of the times. Maybe it's a re-enactment of the homeless encampments that existed in the 1930's during the Great Depression. Maybe it's what it is, a guy with an idea to improve the world. The idea is to help the homeless have better sleeping quarters than cardboard boxes hidden in the bushes. Whatever it is, it also is an enabler to help homeless people stay homeless. It also gives homeless people a better quality of life. This tent is built on what's essentially a shopping cart frame. It has two compartments to store 'stuff', one in the front the other in the rear. It folds down to be small allowing it to be pushed around, uh, like a shopping cart. It unfolds easily and offers good quality shelter. EDAR (Everyone Deserves a Home) is the brainchild of film-maker Peter Samuelson. He describes having become aware there an increase in homelessness and he had an inspired idea to create a solution. This portable tent thing. BTW I yahoogled "homeless statistics" and couldn't find a site that gives current rates or trends in homelessness. It seems likely that the current economic climate is making more people homeless. However this project had to have started a couple years ago during the time when the supposed economic recovery of the Bush Administration was in full swing. I believe that supposed economic recovery was only in the stock market and only gave an illusion of an economic recovery. In any case I wonder if this EDAR thing is the shape of things to come? During the day, the EDAR unit is used to pursue the necessities of life. Personal belongings are secured by the use of locks. The front and back of the cart have storage baskets with removable canvas pouches. The unit is waterproof and provides protection for what it contains. EDAR's wheels are better than a supermarket cart's, being slightly larger and easier to steer in a consistent fashion. There are two brake and locking mechanisms which ensure the unit will not move on its own. At night, the EDAR unit easily hinges out and down to Night Mode in less than 30 seconds, becoming a sleeping unit. Unfolding the unit allows it to lock in place as the flat metal base extends. The metal and wood base has a mattress and military-grade canvas cover, providing a robust tent-like shelter. The unit is flame-retardant, waterproof, windproof and helps protect from the elements. There are translucent windows that provides light and a view of the surrounding area. By re-folding the unit, the EDAR quickly returns to Day Mode. He conceptualized EDAR as a mobile single-person device that would facilitate recycling, the principle source of income for many homeless. Why is this better than a regular tent? Obviously tents have existed for thousands of years and humanity has millennia of experience using tents to camp. It seems to me the improvement here is to make it self contained and easy to push around and to provide security. A tent is bulky, doesn't set up quickly, and people tend to want to leave a tent in a given place once it's set up. I believe tents are frequently used by homeless people but that they hide them in the bushes etc. What about during the day? Tents provide no semblance of security, no locks, etc, and what would a homeless person do to protect their stuff during the day? If EDAR is as good as the claims, a homeless person can lock up their EDAR, securely containing their stuff, lock the EDAR to a bicycle rack or something, go into a building, etc, and have a relatively good assurance their stuff will be there when they return. The EDAR units cost $500 apiece to build. They are constructed by a shopping cart manufacturer. I'm thinking "$500 apiece?? How can that be scalable to provide housing to a significant number of homeless??" That is, if it costs $500 for each unit and there are millions of homeless around the U.S. not to speak of the millions of homeless around the world, who can afford the money to buy one for each homeless? This design may be a bit more practical and offer more income earning options for a homeless person than scavenging recyclables. 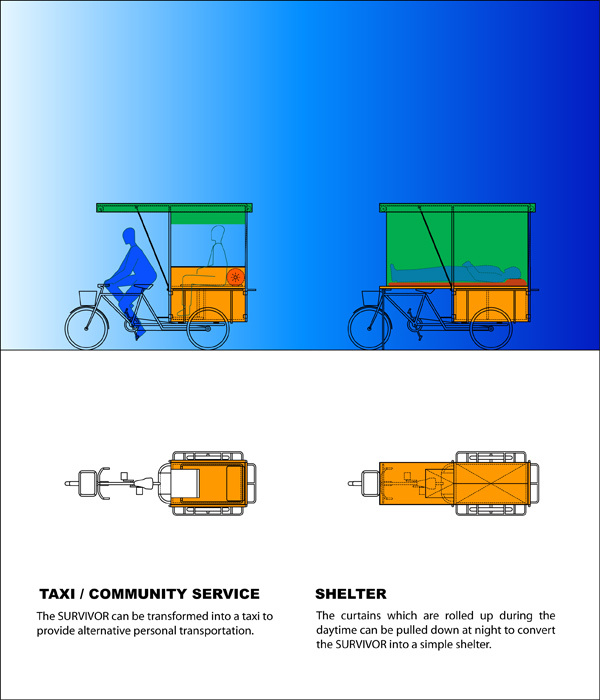 The cart can be used as a vendor cart, and the bicycle wheels provide better mobility than a push cart, and it can be electrified to provide mobility and lighting.